Do you use sticky-notes as reminders? Do you have trouble remembering all you need to do? Do you need to keep your to-do list visible? Put hott notes on your desktop. 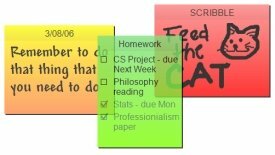 Hott notes is a free sticky-note reminder software program. You can create lists, draw, set reminders, and more. You can even store them away when you’re done with them. Manage a whole bunch of notes without having a deskful of real ones. Create notes in different colors, font types, themes, and transparencies. Hott notes is a great way to stay on track!